Can coaching institutes cut down on topper advertising? 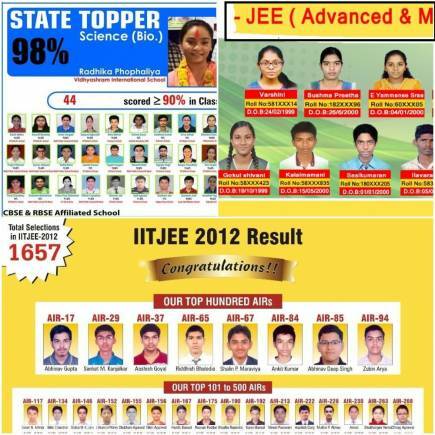 In June 2017, India woke up to a student’s picture splashed across newspapers along with All India Rank 1 next to his name for topping JEE Advanced. The difference: Different newspapers had two different coaching institutes claiming that he was trained by them. In August 2018, the situation is no different. Similar faces are spotted across advertisements of rival coaching institutes with toppers allegedly being bribed by these institutes for use of their picture/name. The Maharashtra government has tried to regulate the activities of coaching institutes through a bill that is expected to be tabled in the winter session. It is expected that advertising for coaching institutes could also be under the scanner and some restrictions could be placed on using the face of students. But the ground reality remains the same across the country. Random pictures of students are used, flashed on billboards (often without permission) or multiple page newspaper advertisements are brought out every time the results of a competitive exam are announced. Bhavesh Rajpal, a 23-year old Indian Institute of Technology (IIT) graduate said there were several ‘brokers’ lining up at his Kota-based coaching institute even before the results were announced. The top performers who were likely to score a rank below 150 were promised a commission for giving their picture to another coaching institute. But these are just a few cases. Often, students’ names and photographs are used without permission just to attract youngsters to the coaching institutes. With privacy laws practically non-existent in the Indian market, the institutes get away easily. You may easily walk into a coaching centre and find photographs of family members posted as ‘toppers’. This is because nobody bothers to fact-check the credentials as long as the brand is big and they keep enrolling more students. The modus operandi is also smooth to ensure that two identical posters of different coaching institutes are spread across a city’s geography or locations so that the stakeholders do not find out. So, the same student’s picture with XYZ institute will appear at a billboard in Noida, whereas he/she will be featured in an ad of ABC institute in Odisha. The advantage? Nobody finds out and they keep cashing in during the admission season. With almost 8X the number of students to the seats available, the competition gets tougher at engineering and management institutes. And coaching institutes make you believe that they are your sole saviour. Since the success of any coaching institute is measured by the number of students who make it to the top 100 ranking of any competitive examination, plastering faces of students is the simplest form of advertising followed by all of them, apart from word of mouth. Though the law could strike down on their activities, it is still atleast a year or more away. Till then, institutes have a free run.